Note: this is a Tech Corner: Classic Edition article pertaining to the traditional Iron-Barrel Bullet 500 engine design (based on the 1955 model Bullet). It was originally published in our Bullet-In newsletter in December 2003. 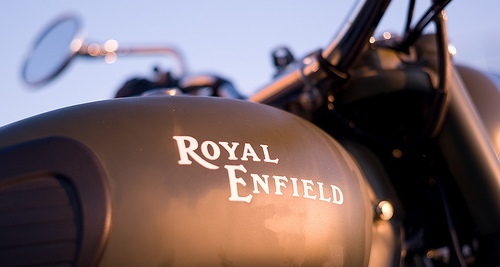 These articles are being re-published for the new audience of used Royal Enfield owners. Originally published 12/2003 – Earlier this week, the boys (actually young men) in our shop were converting my bike from the “Twingle” back to a single-exhaust 535 and couldn’t get it started. When they turned on the fuel, it would pour out of the overflow hoses. They assumed (as did I) that the float was stuck in the open position. This can often be resolved by a swift tap to the carburetor bowl. However, when no amount of “tapping” slowed the fuel down, I had them remove the carburetor and replace the needle and seat. These do need to be replaced occasionally and this is why it’s a good idea to get in the habit of turning off your fuel tap when the bike is not in use. After replacing the needle and seat, the bike still wouldn’t start but was not overflowing. I felt the bowl and since it wasn’t cold, I checked to see if it had fuel in it. It did not. Again we tried the tapping method to see if it had jammed slightly when the bowl was reinstalled. We had no luck. I had the boys remove the bowl and look for any obstruction to the floats. Seeing none, it occurred to me that we hadn’t reset the float bowl height. This is a commonly overlooked procedure. In short, you remove the carburetor and its bowl and turn them upside down. According to the factory specification, the distance from the face of the float bowl to the top of the inverted float should be between 28 and 30mm. I personally prefer to set it between 26 and 28mm. If it is too high or too low you can bend the tang on the float bowl where it touches the needle to adjust the height. Be very careful not to apply pressure to the needle and risk damaging it when doing this adjustment. Sure enough, this cured our problem. The float had been set too high and was cutting off the flow of fuel before the float bowl had the proper amount in it. The wrong float height setting can also cause your bike to run too rich or too lean. So the next time you have the carburetor off or replace the needle and seat be sure to check it.